2012 was one of the most exciting years in the history of Buena Vista. 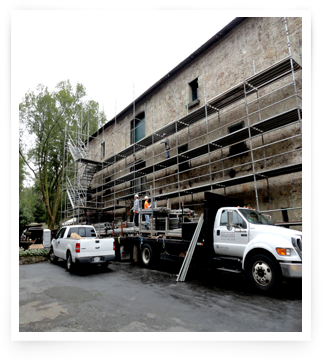 For the first time, in a long time, we looked to restore our historic winery to its past glory. While there is still much to be done we have reached an amazing bench mark by reopening our historic Champagne Cellars to guided tours once again. August 31st, 2012 – was a historic day for Buena Vista Winery. It seems like it was yesterday when we decided to begin this project and already we have finished what has been a challenging few months. From the dangers posed by the retrofit to the laying of the final cobblestone, it has been a daunting task but one that has been beyond worth the effort. The Champagne Cellars will be open for guided tours in the coming weeks. We hope you can join us at the winery to experience Buena Vista all over again! August 31st, 2012 – With hundreds gathered, it was now time for the main event. After numerous speeches from The Count’s descendant Val Haraszthy, Mayor Meyer of Tokaj, the signing of the Sonoma-Tokaj Sister City Agreement, an address from Jean-Charles Boisset and much, much more, our historic Champagne Cellars are open once again! 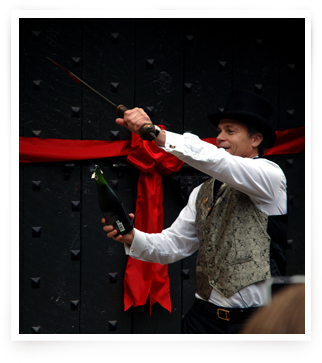 August 31st, 2012 – With the swift stroke of a saber, the cork of one of our delicious Sparkling Wine bottles is removed, beginning a day of celebration as we reopen the Champagne Cellar doors. Our new French oak vats and barrels are now in place as we await the beginning of the 2012 harvest, the first vintage of wine to be made in the cellars in decades. August 23rd, 2012 – For the first time in months we are able to take a deep breath and realize that our goal has almost been reached. With only a few days before the rebirth of our Champagne cellars the dust is finally beginning to settle so that we can see the light at the end of the tunnel. For those of us who have watched this amazing restoration take place we can hardly believe that the work is beginning to wrap up. August 12th, 2012 – With the retrofit now complete we have been able to begin work on the rest of the path that leads to the front of our cellar building. The concrete has been poured and our stone masons have been hard at work hand chiseling and placing the cobblestone that now makes up our new courtyard. 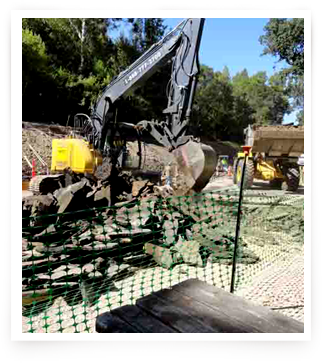 The asphalt is being replaced with a decomposed granite pathway and cobblestone that is reminiscent of the original pathways that used to be present at the winery. August 6th, 2012 – It is now only a matter of time before phase one of our restoration is complete! Over the course of one week the pathway from our press house to the Champagne Cellars has taken shape. We can feel the excitement in the air as the celebration of The Count’s 200th birthday and the reopening of the cellars draws closer. July 27th, 2012 – With the scaffolding now completely removed from the Champagne Cellars we are working, full force, on the exterior landscape. The asphalt was torn out and is now being replaced with cobblestone. Work on the vineyards and fountain is continuing as well. 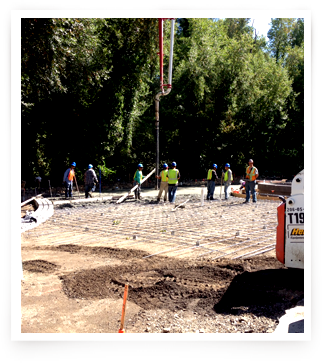 The concrete, which will act as the foundation of the cobblestone, is poured. Everything that has been in dire need of help over the past decades is now being repaired and restored. July 26th, 2012 – The work on the exterior walls of our Champagne Cellars is complete! For the first time in months we are able to see the progress of our stone masons who worked so diligently to restore our cellars to their former glory. 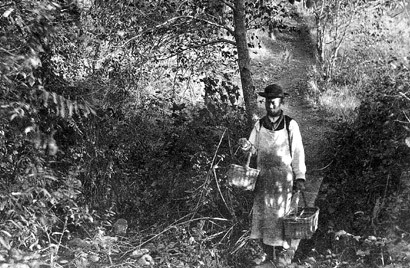 As we move forward we will finish re-landscaping the property for the 200th birthday of Count Agoston Haraszthy at the end of August 2012. 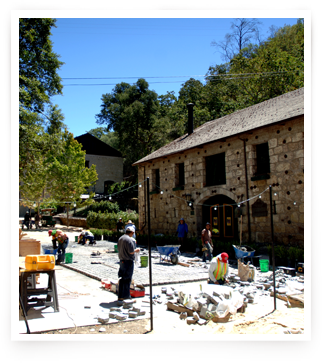 July 17th, 2012 – The stone masons from ARGCS have been an integral part of the restoration of our stone winery building. With the damage caused by the ivy that had grown around the building as well as the amount of time that has passed since the building was completed, there was an enormous amount of work to be done. Now that they are wrapping up their work, we had the chance to talk to them about what went into the restoration process. This interview goes into the details of their work as well as the challenges and dangers that they encountered. July 13th, 2012 – With the asphalt now gone we have begun refurbishing the areas that were once previously not accessible. One of these areas is the fountain that used to stand in front of the Champagne cellars. With the retrofit we were forced to remove the fountain to allow for our contractors to have better access to the entrance of the building. Now that much of that work is complete we have begun the reconstruction of the fountain so that it matches the beauty of the cellars. 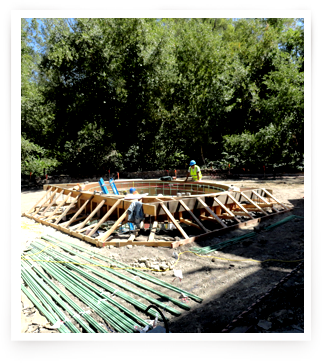 July 10th, 2012 – With the work on the exterior of our cellar building well underway we shifted our focus to the landscape surrounding both the cellar building and the press house. As of June 8th we have begun breaking ground on a landscaping plan that is meant to refurbish and reinvigorate the land around our historic buildings. Not only will it be cleaned up but we are planning on planting vineyards on site once again. As you can see in the photo to the left work has begun and we are excited to continue the restoration of the property by moving onto this historic next step. 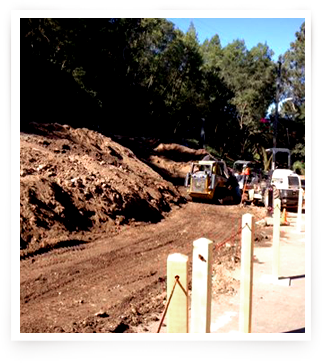 June 19th, 2012 – Along with the retrofitting of our stone winery building we have also begun restoring the winery grounds beginning with the road which leads you to the tasting room and Champagne Cellars. Over the course of two weeks there was an immense amount of movement as we tore out the old asphalt driveway so that it can be replaced. It was a trying time as the areas in front of the tasting room and the cellar building were torn apart and totally in flux. 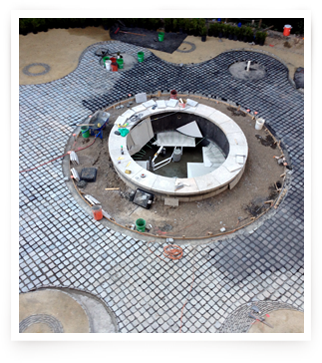 Now we have begun filling in the roadway and will begin to install the new cobblestone and decomposed granite path. May 5th, 2012 – Dennis Cox of RDC Construction is the man who helped develop the technology known as Center Core Drilling. 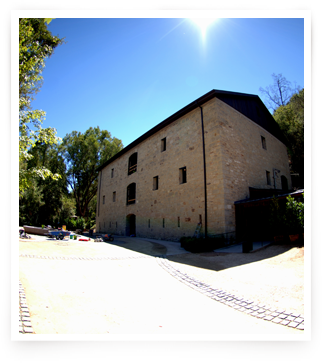 His technological breakthrough is one of the reasons that our historic winery building will continue to stand for generations to come. 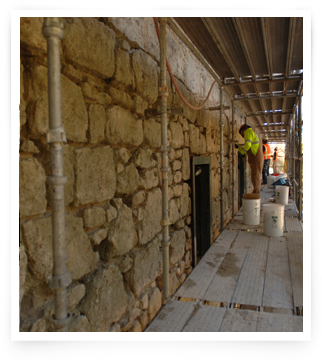 Not only did Dennis’ team retrofit the old stone walls but it also helped preserve the cellar building to the point where it will look and feel like it did when it was built in the 1860s. 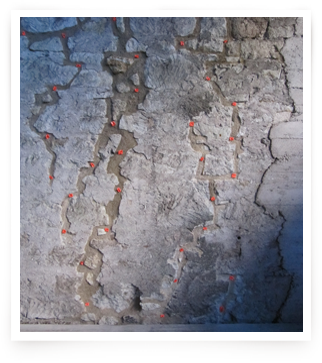 April 9th, 2012 – The strengthening of our stone winery’s walls consists of an innovative technique called Center Core Drilling. The reason we have applied to the retrofit process is that it strengthens the exterior masonry walls with no visible evidence. Meticulously calibrated drilling equipment is used to drill four to six inch diameter cores, on center from the top of the wall to the bottom of the wall. A single rod of reinforced steel is placed in the core, which is then filled with grout to create a reinforced vertical column that strengthens the stone wall. 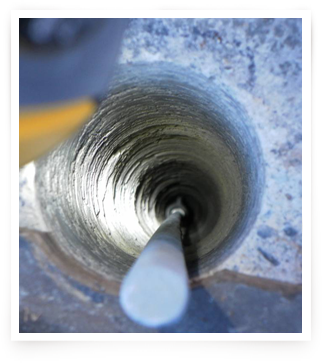 These cores are drilled in a series of short sections to reach the ultimate length of approximately thirty-eight feet. 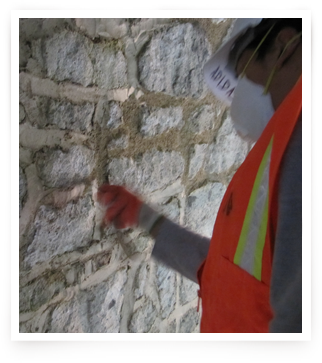 March 27th, 2012 – This is the process of re-grouting the outer layer of mortar that exists around the stonework of our winery building. We have created a unique mortar, after numerous test mixes, to ensure that it is compatible with the soft characteristics of the original stone as well as a match for the original historic mortar. We settled upon Natural Hydraulic Lime (NHL) to be the perfect match for these repairs. It is a natural material that sets with water and achieves additional strength when it absorbs Carbon Dioxide. It has been used for centuries throughout Europe, dating back to the pozzolanic cements that were used by the Roman Empire. 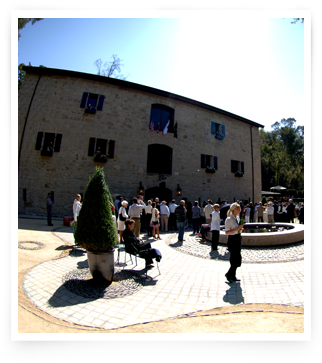 March 24th, 2012 – The restoration of our winery’s masonry consists of many steps. In the 1940s attempts were made to make repairs on the building, however these repairs were done poorly and are in need of repairs once again. The steps that we are taking are re-pointing all the joints, replacing cracked and deteriorated stones, repairing wall cracks and removing all of the existing mortar. The sloppy installation done in the 1940s was an excellent example of poor craftsmanship. February 24th, 2012 – An up-close and personal look at the work our stone masons are up to. As you might imagine there has been some wear and tear on the historic cellars over the decades. It is up to our extraordinary team of stone masons to repair all the gaps in the in the stone work before we can move forward with the restoration process. There are five stories of scaffolding that have been constructed so that each inch of the building can be examined and repaired if necessary. February 10th, 2012 – With the ivy now completely removed, scaffolding has begun to arrive and be constructed around the outer walls of our cellars. Upon their completion the stonemasons will begin the process of checking and double checking every nook and cranny of the outer walls for repairs. Most, if not all, of the outer walls will be regrouted to ensure that each stone is set in place. Each side of the building will have to be checked. This process that will be time consuming but will help maintain the structural integrity of our cellars for their grand reopening. Once we are finished with the outer walls we will then be able to move our work indoors. 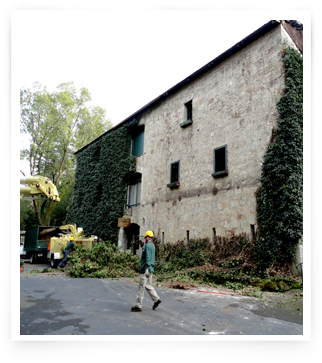 January 24th, 2012 – Soon after the cellars were inspected we began removing the ivy around the outer walls of the building. In doing so we will be able to gain much more insight into the condition of our historic cellar building. The process took a couple of days as the ivy was extremely thick and covered multiple walls of the cellars. Our expert crew made it look easy and for the first time in years we were able to see the true character of the magnificent building that we have come to love. With the ivy now removed we are bringing in stonemasons to patch up and repair any areas of the outer stonework that are in need. 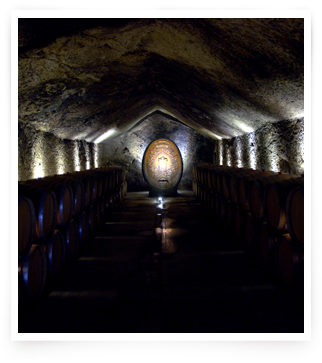 January 1st, 2012 – Our historic cellars have been unavailable to the public for decades. It was time to put a plan in motion to reopen the historic cellars for all to see. Much work needs to be done to achieve this goal, most importantly retrofitting the building and ensure that it is structurally sound. 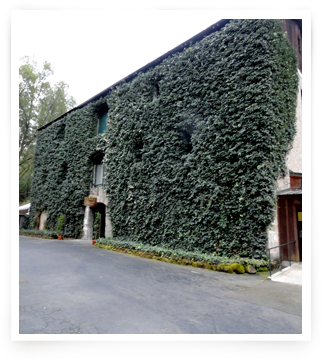 After the inspection we will begin removing the ivy that has grown up the walls of the cellar building. This will allow us to delve further into the stonework of the building to make any necessary repairs.